Posted 11 December 2010 in Day Entries, Earth, Mister Miracle #1, Weapons & Devices. Looking like a life-size Rockem Sockem Robot — a very imposing sight from across the table, no doubt — is Stuka’s creation, an automaton (albeit rather shortlived!) with right hand significantly larger than the kingpin’s. Then, with the final word on Steel Hand’s defeated mechanized adversary, the crime lord says, “Well, he was good for a laugh! You can junk him now!” What an ignominious fate for Stuka’s expensive device! Posted 10 December 2010 in Day Entries, Earth, Inter-Gang, Mister Miracle #1, Villains. 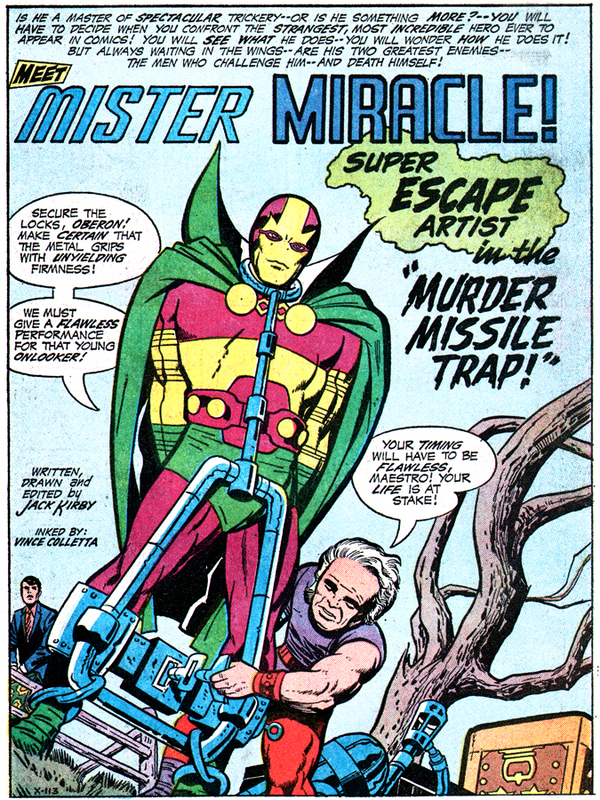 The villain Jack Kirby created for the first adversary to tangle with Mister Miracle? It’s Inter-Gang mob boss Steel-Hand, who lost his right hand to a machine gun fuselage and now sports a radiation-powered appendage that can destroy some of the strongest metal on the planet! Scott: I realize that I have no right to ask — but are you involved in some way with — Inter-Gang? Thaddeus: Not with Inter-Gang, boy! — With their division chief in this area — Steel Hand! 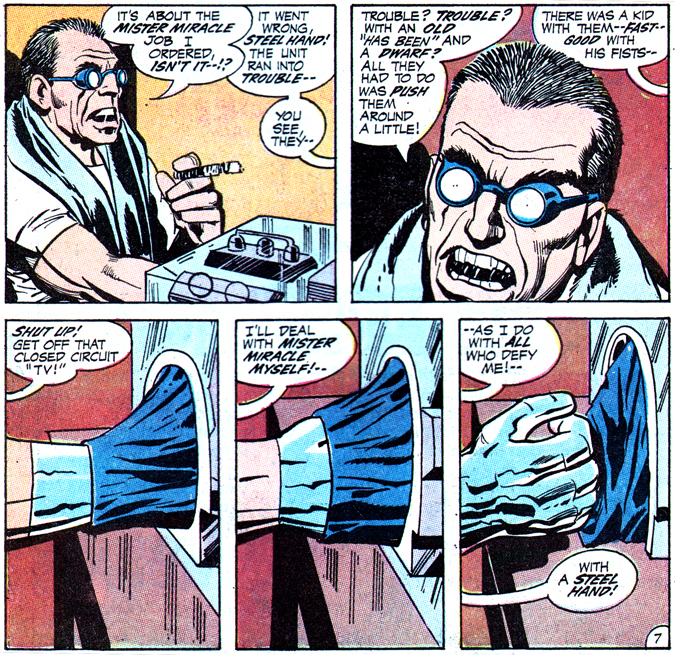 The scene shifts to the villain’s Metropolis headquarters, where his left hand holds a cigar and right is snugged inside of a typical Kirby contraption, and his underling is reporting the fight. “Trouble? Trouble? With an old ‘has been’ and a dwarf? 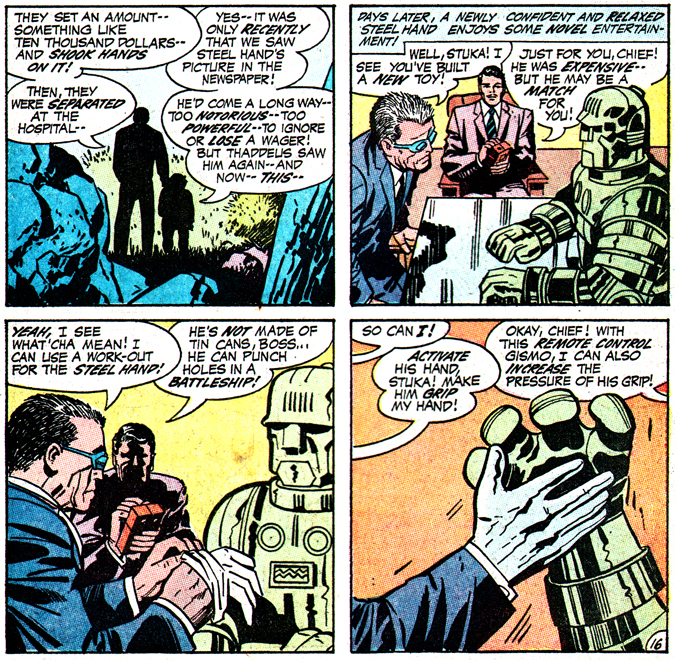 All they had to do was push them around a little!” But Steel Hand hears of Scott Free — “Fast — good with his fists –” The bespectacled criminal takes his hand out of the container to reveal an apparently solid-metal hand! Steel-Hand’s origin begins when he was a two-bit nobody. The gangster squawks (with no one in the room), “Ha ha ha — To think I was once at the end of my rope — a sniveling little loser — with his hand blasted by a Tommy-gun — then came a turn of luck — in the hospital — that surgeon — experimenting with transplants –” He approaches a huge riveted metal block, raising his metallic fist above his head, continuing, “He gave me this new hand! I didn’t know its history — but with radiation treatments, it gained power — power! My life changed after that! I smashed my way into a top job at Inter-Gang! — Just as easily as I smash this great bar of solid titanium!” With that, Steel Hand slams his… ummm… steel hand to decimate the enormous object! Jack’s next caption reads, “But despite his arrogance, Steel Hand fears the loss of his status!! Somehow, Mister Miracle is linked with that deep-rooted fear! — And, thus, a brutal decision is made!” So the kingpin calls his henchmen into the room and plots the end of the Super Escape Artist! Cut to a few days later, when Steel Hand arm wrestles and beats a robot opponent, only to have the new Mister Miracle jump in a window behind the bad guy. “You! I-I don’t believe it! Y-you’re dead — dead!” They tussle while Steel Hand’s goons are notified and the Super Escape Artist is knocked unconscious, only to be placed in jeopardy by his new nemesis. “This time he gets what he asked for — an escape-proof trap!” vows Steel Hand. Posted 9 December 2010 in Apokolips, Day Entries, Earth, Heroes, Mister Miracle #1. In our previous post, we’ve had a solid, pretty thorough look at the background of the person called Scott Free; now let’s examine the hero named Mister Miracle! The original Mister Miracle was Thaddeus Brown, the renowned escape artist also known as The Great Thaddeus, and, as best as can be ascertained, has performed his death-defying act before audiences decades prior to the events of our current episode. Recently he has decided to stage a comeback, divising bigger and deadlier traps from which to escape. But time is catching up with the showman, enough so that his longtime faithful assistant Oberon fears for the old man’s ability. “Be content with your past greatness! — During these years of inactivity — time has passed you by!” But Thaddeus will have none of it. Upon avenging Thaddeus Brown by seeing his killer brought to justice, the young man assumes the role of a master escape artist with Oberon’s blessing, taking sanctuary in Thaddeus’ home and donning the costume of Mister Miracle. No doubt the tiny assistant can see in the newcomer’s bag of tricks gadgets that can perform miracles, as well observe the young man’s charm and wondrous abilities, and decides there might be a good life to be had in this escape game with a performer like Scott Free. But the greatest of all devices is Scott Free’s Mother Box, a gift from her creator Himon, and a life-saver throughout the series. (“Well — there’s Mother Box! She HELPS — but she doesn’t do it all! But no one can build her!! She must be earned! !“) As we’ve found in the earlier entry devoted exclusively to the Mother Box, a miraculous contraption held by many of New Genesis and some on Apokolips, Mother Box is a sentient computer who has emotions and rudimentarily communicates via pings, can sooth and heal its possessor, and perform any number of amazing feats. It can also die. When first we see Scott’s beloved friend, he uses it to ease fatally struck Thaddeus into the hereafter. The original Mister Miracle’s last words are, “What is it — I hear — a sound — a voice — comforting, easing — the pain is — gone –” as Scott’s device softly pings to the dying man. “It looks like a box — but it has a strange power to it –” Scott tells Oberon. Mother Box can also kill, as she destroys Overlord after almost being killed herself, and later, helps her master avoid being impaled when a metal bar is jammed through a trunk where our hero is trapped. Scott: I-I haven’t explained Mother Box to you, Oberon — But she is dear to me — and I must help her! Oberon: Y-you mean that thing — is alive? Scott: In a way, she is! But, now, she’s hurt — weak — I must pour out my love — my belief — to make her respond! When poor Mother Box is completely fritzed by Doctor Bedlam, Scott duplicates her circuits inside of his hood and tricks Bedlam who is encased in an “electronic web of micro-cosmic atoms.” Unfortunately, from thereon in, virtually no reference is made to her, now just a bunch of wiring and microchips inside the mask of Mister Miracle. An ignoble fate, but she was really something in her day, she was! Scott: More than that, Barda! Living, or dead — you and I are proof to all of Apokolips — that it can fall!! Barda: Well, then!! Victory before the battle leaves little left but to enjoy it!! Let’s tear the top off Apokolips! It’s around that time when readers could sense the couple was falling in love, but we didn’t know for sure until the Great Thaddeus’ son Ted boldly asks Barda the question: “Tell me — are you in love with Mister Miracle, Barda?” Barda replies, “Until now — I-I never gave it much thought!” But we knew all along, didn’t we…? Barda: Sweet fool! That was a close call! Why didn’t you leave me? Scott: Then, let’s do something that does count! Let’s get married! Right away! 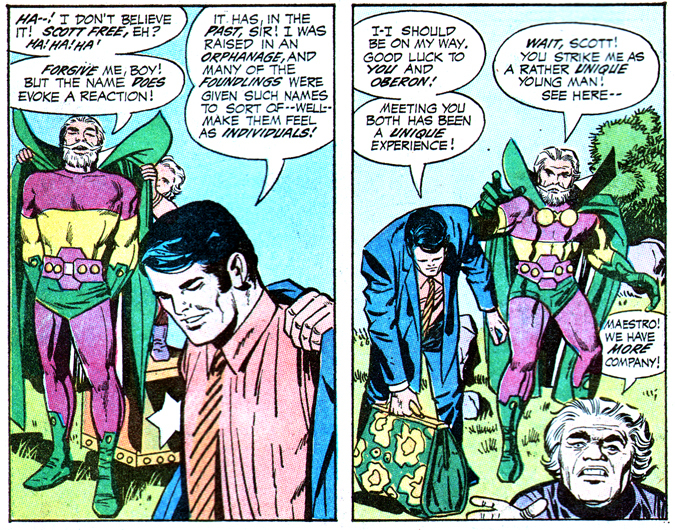 Highfather: So it must be! … This cannot be stopped! The Source has sanctioned this marriage in words of fire! When I touch you both with the Wonder Staff, The Source shall make you as one! Barda: I am eternal with Scott Free! Scott: I am eternal with Barda. Highfather: Thus, it is done! What I have so failed to mention is the irresistible charm of Mister Miracle, both as a flamboyant, colorful swashbuckler of a super-hero and as a somewhat atypical personality for comics. Scott Free exudes a sincerity and grace that, for this writer at least, rings especially true, resonantly so. American comic books of the costumed character variety had become accursed with the advent of “camp” — [American Heritage Dictionary: camp n. 1. An affectation or appreciation of manners and tastes commonly thought to be outlandish, vulgar, or banal. 2. Banality or artificiality, when appreciated for its humor. —adj. Having the qualities or style of camp. … To act in an outlandish or effeminate manner. [Origin obscure.] — camp’y adj.] — which had rigid, square-jawed hyper-muscled Boy Scouts mouthing pithy homilies with a vastly out-dated “Aww, shucks” faux humility (“Just doing my duty, ma’am!”). And the mainstream comics’ reaction to the teevee show Batman and its wake of damage, coupled with the iconoclastic sentiment of an increasingly cynical and pessimistic society, was the advent of the anti-hero in the medium, particularly in the form of the former Caped Crusader and now Darknight Detective. 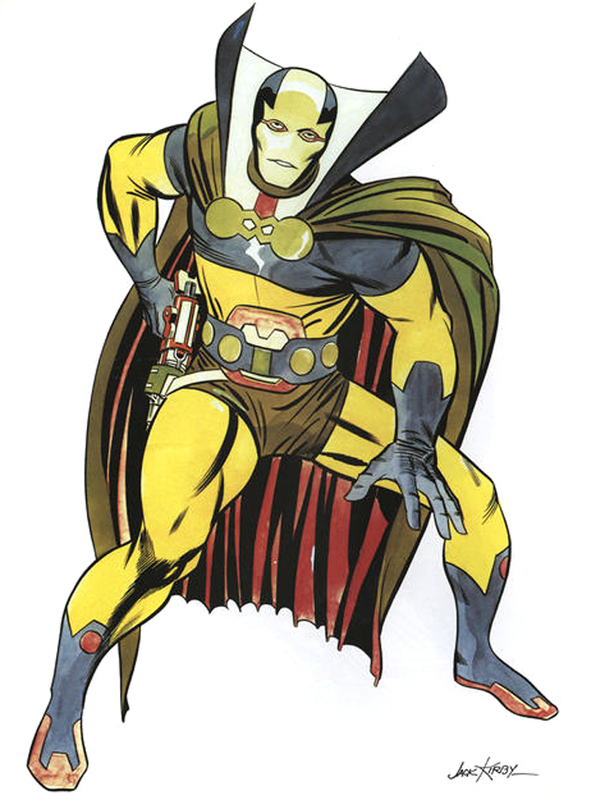 But Mister Miracle, for all of his nuttiness in voluntarily facing death time and time again, is authentically humble and quite well-mannered, astonishing attributes for a character who has been raised in what might as well be Torquemada’s persuasion chambers. There are a few other instances of Scott being understandably ill-mannered to his former superiors — giving Virman a veritable Bronx Cheer by barking at the fake Prussian, “What if I tell you to go blow your nose!? !” — and to future allies — after first meeting the Apokolips rebel leader and Himon greets him as a “skinhead,” Scott boasts, “How dare you call me that? I’m an Aero-Trooper of Darkseid’s own elite! — but etiquette is not paramount with the Super Escape Artist. Rather, Scott believes greatly in fairness and honor. When Granny’s officer Virman Vundabar snifs at Barda, “Great Darkseid rules Apokolips like a colossus!! His is the creed of destruction! — not fair play!” it is a perfect juxtaposition of just why Scott Free is so very out of place in his adopted world. 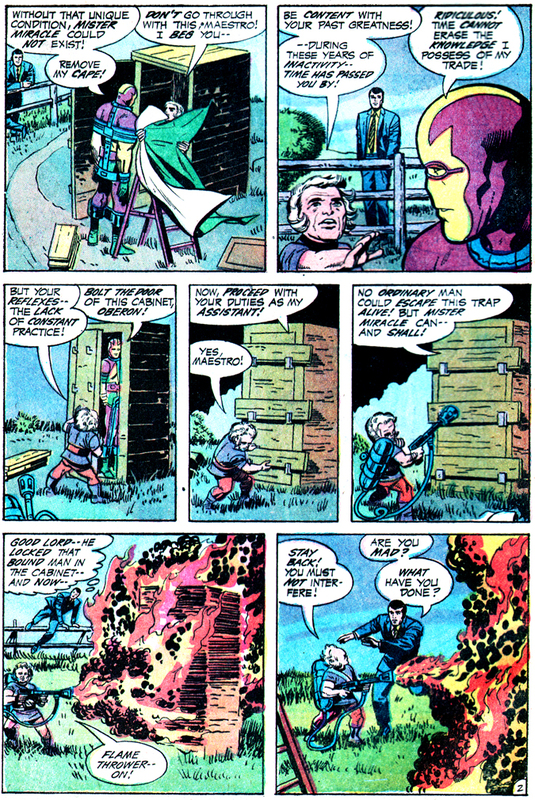 Y’see, if Mister Miracle is about anything, he’s about a righteous, almost pathological devotion to fair play. The cover blurb on #1, I think, is wrong: The character doesn’t cheat death; he just beats it fair and square, time and time again! Engaged in a death match, in the Id world of The Lump, rather than boast the usual Marvel super-hero “I’m gonna thrash your hiney” exclamations, Mister Miracle pleads for a peaceful resolution: “Look here, Lump! I’ve submitted to ‘Trial by Combat,’ but the choice of this battleground was not mine!” But the pink-pigmented monstrosity isn’t listening, “This is my world! My world! Here, I live! Here I’m free! !” But Scott persists, “Believe me! I-I understand! Perhaps if we both remain cool we can reach an honorable solution!” But Scott’s rationality does not sway the tragic creature. Scott Free fervently believes in righteous behavior despite being taught despicable values. His belief system is all about doing the right thing and doing things right. 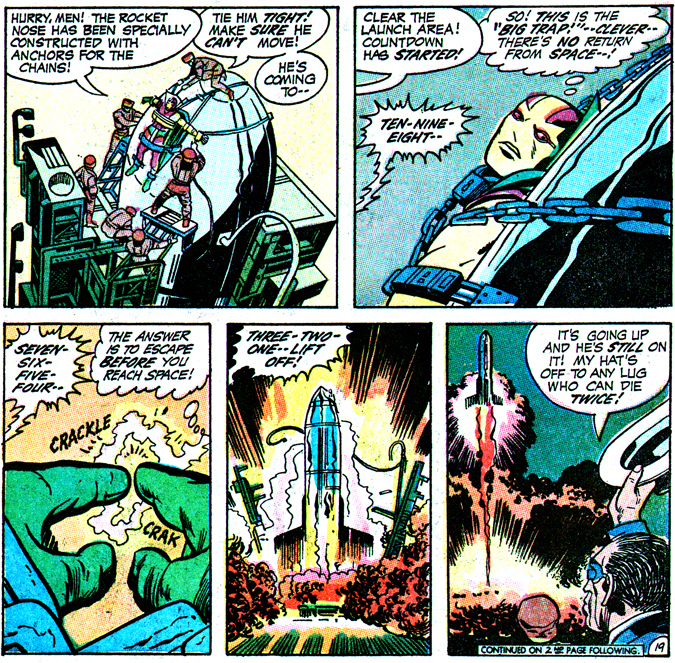 While he grabs Stuka’s gun and boasts to his first adversary as super-hero, “The age of miracles isn’t over yet, Steel Hand!” Mister Miracle doesn’t shoot his enemy (though momentarily strikes a pose similar to the one Jack used in his initial pitch of the character — seen below — when the creator envisioned the character wielding a weapon), and in fact just chucks it away! Scott has a code of conduct at home, as well, telling his future wife, who has been bickering with Oberon, “This is a house of friends, Barda! The strong don’t rule here!” And his professional ethics are discussed in an amusing moment with Oberon. 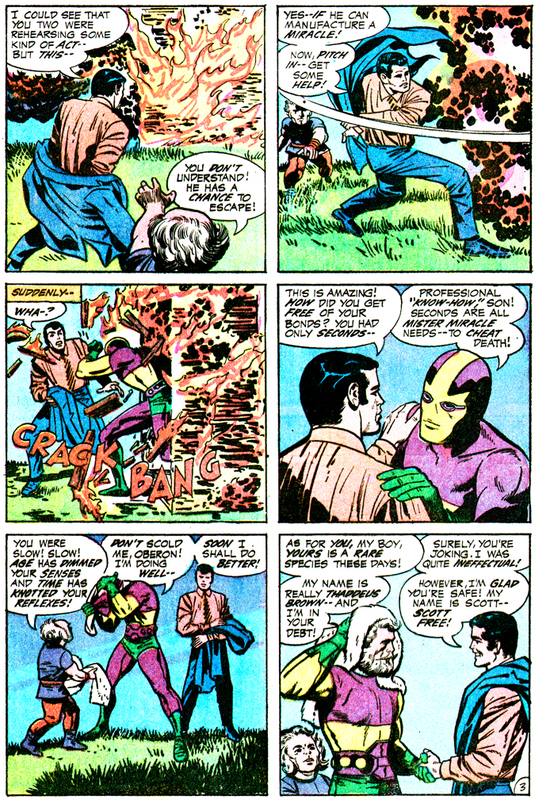 When his assistant insists on hearing how Scott escaped a certain-death trap, Scott replies, “I-it just isn’t cricket for Mister Miracle to reveal his amazing secrets!” a declaration immediately followed by a blow-by-blow description of the hero’s efforts under the guise of coy suppositions. While we are privy, upon reading “The Pact” that Scott Free is the son of Izaya the Inheritor — the supreme leader of New Genesis, Highfather himself — there’s never an indication, in the entire series, that Scott knows of his august heritage. Yes, Highfather does perform the marriage ceremony for his son and Big Barda, but ne’er a hint is given that he is father of the groom. And, come to think of it, while each of the new gods on Scott’s birth planet seem to show aptitude for fantastic powers, Scott Free possess relatively mundane abilities. Yes, his timing and physical agility is extraordinary by Earth standards, and his grace under fire exemplary, but couldn’t that fairly be credited to his Aero-Trooper training on Apokolips as well as the brutal tutelage of Granny and her Happiness Home flunkies? Certainly he’s smart, clever and resourceful, but Scott is nowhere near Metron’s class on the intellect scale… No, Scott can’t measure up to the residents of Supertown when it comes to the physical and mental realms. I think, maybe, his is the power of the heart, resolved to live his life in complete defiance of fear and death, loving and loyal to friends, compassionate and caring to whomever seeks his help. For all the horrors Scott has suffered — mother killed, abandoned by his father, a brutal upbringing in Granny’s hellish institution, savagely beaten and ostracized by his peers, finally finding a place to belong in Himon’s sanctuary only to have it destroyed, realizing the implications of Auralie’s ruthless murder (that there never will be no room for individuality, beauty or art in Darkseid’s domain), nightmarish forces snapping at his heels to kill him — for all that, Scott Free remains hopeful, optimistic and a man of the heart, unafraid to show love, unafraid to stand up to evil, unafraid to believe in a better universe. Unafraid. Posted 8 December 2010 in Apokolips, Day Entries, Earth, Heroes, Mister Miracle #1, New Genesis. Scott Free, the son of Highfather and whose escape from the dominion of Darkseid was catalyst for the Super-War now raging, is arguably the focal point of the entire Fourth World saga. Born on the pastoral paradise of New Genesis and raised in the urban chamber of horrors called Apokolips, Scott has fled his adopted hellhole of a planet and assumed the identity of Mister Miracle, super escape artist, and calls Earth home. He is, it seems, a happy masochist, perpetually placing himself in exceedingly deadly situations, engaging with the most sadistic of villains and always — always — playing by the rules, whether earthly, celestial or deviant, no matter the odds stacked against him. He is indeed a man of miracles, quite possibly the ultimate savior of the two worlds of the new gods and, by saving his own skin innumerable times and defeating world-threatening foes and devices, a protector of Earth itself. At that moment, Granny Goodness, one of Darkseid’s elite and head of the regime’s military academies, carries a bundle. “Hail, great Darkseid!” says Granny. “See what I hold!! See what was so gently nudged through the dimension threshold — from New Genesis! !” Wrapped in a blanket it is a young boy. “Izaya’s whelp, eh?” Darkseid observes. “This will hurt him!! He’s surrendered his prize lamb — for a tiger! !” For, in return, Highfather will become guardian to the feral, fierce son of Darkseid and Tigra, Orion, who would grow to be the greatest of all warriors on New Genesis. “Until — sire? ?” asks Granny. Issues #4 through 8 of Mister Miracle had larger page counts than the rest of the run and they accommodated a particularly fine treat for avid readers who wanted to find out more about this enigmatic super-hero with a mysterious past. 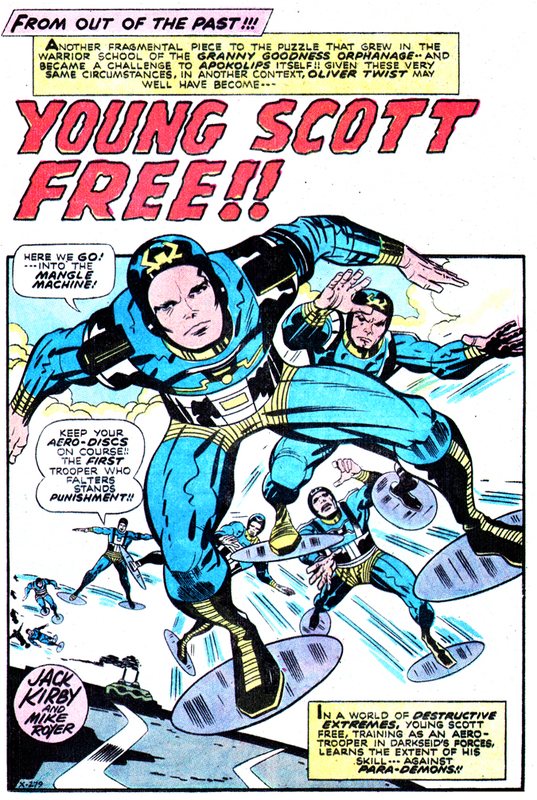 Short vignettes titled “Young Scott Free” gave us glimpses into the boy’s military training and how one god from New Genesis took a special interest in the future Mister Miracle. 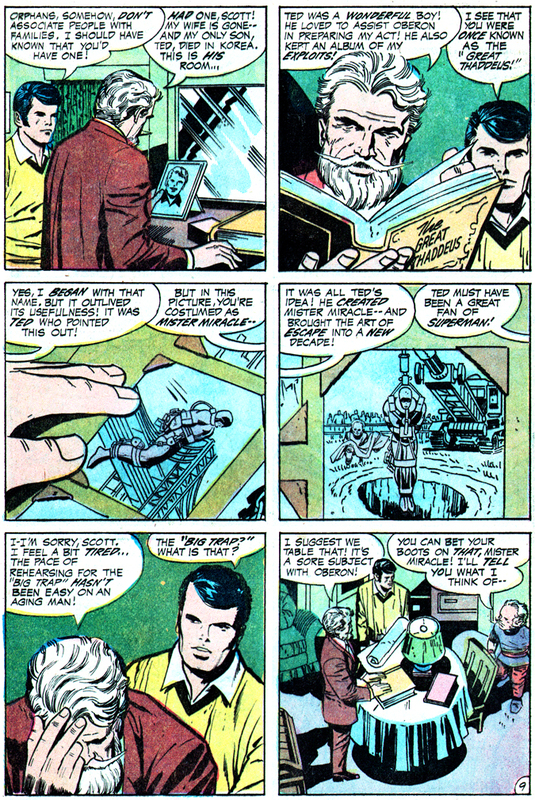 Scott’s burgeoning competence as an escape-artist is center of the last, four-page scenario, which has him training on his Aero-Discs, which comprise a pair of a metallic cylinders on which the user places his feet, giving the ability of flight (Scott would use these as Mister Miracle) and engaging in a mock battle with para-demons. Barda: Yes, this is a far cry from our days as pupils of Granny Goodness! Scott: You should have gone with me — when I escaped from her institution, Barda! Barda: Yes — perhaps I should have — but I stayed! Stayed — to become… what I am! Barda: How about your welcome for Big Barda? Scott: Maximum is the word for you, Barda! I could never think of you without deep and genuine fondness! Barda: I helped you in your first great escape! Scott: Yep, Oberon! 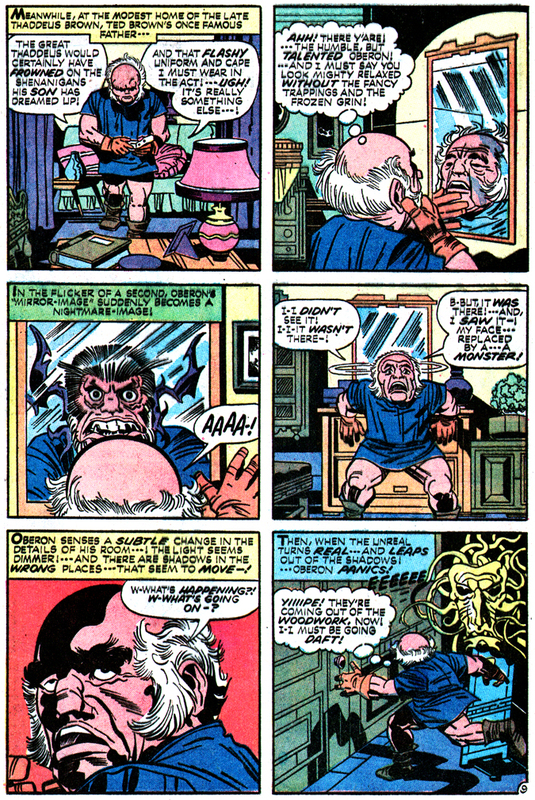 If not for Barda, I might have turned out to be a grim, tough product in the Granny Goodness tradition! Barda: I risked severe punishment to help you bolt Granny’s institution! From then on, the pair are inseparable, first as comrades, later in a more intimate capacity. By the end of the Vundabar affair, their relationship begins to grow more meaningful after Barda apologizes for having been daunted about Scott’s safety (Barda says, “Scott–!! Scott — forgive me!! I-I was afraid! — for us! I — a warrior–” And Scott replies, “You’re better than that, Barda!! You’re a woman! !” as he flies atop his Aero-Discs, carrying Barda in his arms), the couple becomes closer, more caring, and a deeper bond develops. And as their lives are an endless defense against Apokolips interlopers, Scott begins to contemplate another escape plan, this one far away from home base, apparently ground zero for Apokolips hierarchy and each one with the same beef against Scott. Enter Funky Flashman, a con man looking for a pigeon, and the Female Furies, Barda’s former command now ordered to kill her and Scott. Funky tries to sell himself as an able business manager to Scott, who despite knowing the scoundrel is a “transparent second-rater,” see the promise of touring as a way to get away from the Apokoliptian hordes. Scott tells his assistant, “Touring means constantly on the move, Oberon!! That’s what’s important! We must become mobile!” And the onslaught of Stompa, Lashina, Mad Harriet and Bernadeth only add to the itch to hit the road. Scott: Will the hunting dogs never stop coming!?! … Earth isn’t small! Perhaps we can lose ourselves in hamlets, cities — continents –!! Perhaps, in time — the forces of Apokolips will give up the hunt!! Barda: It’s a delusion, Scott! Only I’ll buy it! Scott: Our battle is with the forces of Apokolips! — and with ourselves!! We had the courage to break free of them! — Do we dare to return — and face them down?! Scott: Enough Barda! There is NO freedom in running!! I’m going BACK and win it THEIR way!! — in TRIAL BY COMBAT!! Scott: We must leave, Oberon!! Oberon: Why must you leave!? Why!? You escaped from Apokolips once! Do you think that Granny Goodness and her creepy pets will let you do an encore?? Scott: No!! But strangely enough — like all organized societies, Apokolips exists by rules!! — Made by Darkseid — and kept by his subjects!! This time I must escape from Apokolips — within those rules!! “The Apokolips Trap” and “The Battle of the Id,” the remarkable homecoming issues, show us just how much all-consuming fear the elite of Darkseid’s world have of this unassuming young man and to what lengths they go to in their attempts to destroy him. Only Kanto, Darkseid’s personal assassin, gives Scott proper respect. The others, Granny most of all, yearn to be first to tell Darkseid that Scott Free is dead. After the dust has settled, Scott, in a sweet moment between the increasingly intimate couple, tenderly soothes a tearfully distraught but now relieved Barda after “The Battle of the Id”… There’s a growing attachment here between these two. Then comes the true origin tale of Young Scott Free and certainly one of the most important stories in the tapestry we call the Fourth World. Now, with “Himon,” we get the complete story of Young Scott Free’s escape from Apokolips, certainly one of the best single stories in American comics. It is everything we love about Kirby’s work: it’s kinetic, passionate, visceral and unabashedly afire with pure, primal rage… It is dark, hopeful, vicious and profoundly sweet. It is, my friend, not to be missed. Oberon: [Speaking of Virman Vundubar] His name is even goofier than yours!! Did all you orphans get tagged that way? Scott: I’m sure you’ve read Dickens’ ‘Oliver Twist!‘ The kids in that situation had such names — ‘Artful Dodger!‘ — Oliver himself! Oberon: Sure! I get it! There is a similarity!! But it ends right there!! Your orphans are hardly the wide-eyed, helpless type! Scott: True! The products of Apokolips — wield the power of Apokolips!! Metron: Scott Free will play no part in [the Orion/Darkseid showdown in Armagetto]! His destiny is to escape from Apokolips! Darkseid plans to kill him for that and begin a new war! You must help Scott escape unhurt! Himon: You showed Scott the way to me — and I can teach him to escape Apokolips! But I can’t give him the resolve! Only Scott can renounce what he was here! But a destructive revelation is not a father! — And a slaughterhouse is not a home! — For one born on New Genesis! Himon: Yes, Scott! Darkseid fears you, too! Because, you, too, can dream of things beyond Darkseid! What is the dream released inside Scott Free? Scott: I-I don’t know –! I — think — it’s serenity — embodied in the voice of a woman — I-I cannot see! Always she says — ‘You know, Izaya, — I’ve never heard you sing –‘ I cannot see the woman but I’m filled with the serenity she brings! Himon: That dream is yours, Scott! Yours!! Barda: To dream beyond Darkseid!! — On Apokolips, it seems unthinkable!! Soon Scott Free makes a run for it. “Then, escape finally comes! Scott is stripped of his rank! His mechanisms taken! — All but his Aero-Discs! He bolts!” And young Lieutenant Barda helps him in the breakout. Scott: Barda! What you’re doing is unheard of here! Why are you helping me? Barda: Because I like to help fools! — Because I couldn’t save Auralie! I don’t know! Barda: Not — yet — Scott! I-I’m not ready — perhaps — someday — keep going! And protected by their own mysterious powers against the forces that bind Scott, two allies await! Scott: Himon! Metron! You’ve created a Boom-Tube! It’s denied to all but Darkseid’s hierarchy! Himon: It’s open to you, Scott! An open door to — Earth! Darkseid: HE CAN TAKE IT! I’LL NOT STOP HIM NOW! IF COURAGE AND BRAVERY TOOK HIM HERE! — SOME OF IT WAS MINE! STAY, WARRIOR! LET ME COMPLETE THE DESTRUCTION OF SCOTT FREE — SO YOU MAY LIVE WITH THE MAJESTY THAT IS THE POWER OF DARKSEID! Darkseid: The young fool goes on! He struggles to rise! If he leaves Darkseid, he’ll still find Death! Himon: If he leaves Apokolips, he’ll find the universe!!! Scott: LET ME BE SCOTT FREE — AND FIND MYSELF! 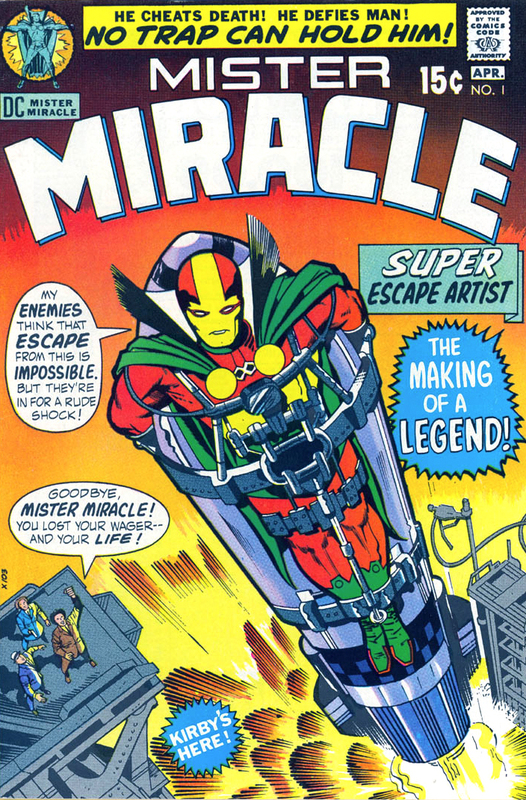 Next entry: Life After Apokolips: The Life and Times of Mister Miracle, Super Escape-Artist!